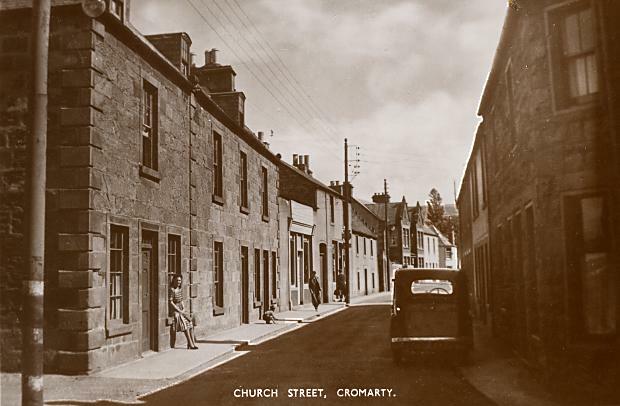 Cromarty Image Library - Church St - c1950? This postcard is taken from the top of Oswald Lane, with the date being a guess based on the car. The shop on the left was McGregor's during the 1960s. The shop was also know as Tunnys. He [Mr Macgregor] used to sit behind a partition behind the door and herself Mrs Mac behind a pile of crisp boxes at the counter. I remember that when we first arrived in the town in 1966 Mrs MacGregor was either ill or infirm and spent most of her time in the upstairs bedrom. She used to throw out thruppeny bits to passing children. Later on, in the 70s, the premises was taken over by a family called Blue, who changed it into a sort of mini-supermarket. They also opened a chip shop. The whole lot closed down within a year, I think. Not making enough money I suppose. I've always wondered what happened to them, anyone know? I remember Mrs Blue in partucular being a very nice lady. Anyone know what happened to the MacGregors? I think but not sure that they went to their daughters down the coast, their grandson used to do the school taxi run until a couple of years ago. The house on the left with the woman sitting on the window was 24 Church street, where we first lived when we came to Cromarty. The entrance then, was round the corner to the left. I'm a little curious as to who the woman on the window is too? Anyone? When showing this photo as part of an exhibition to the Fourways Club, Bobby Hogg told me that the 5th building on the left, with the crowstep gable, was called Alma Hall. It was owned by 'Meiserie' Hossack, who Bobby can remember as a 90 year old, and he had fought in the Crimean War, hence the name of the house. I think the lady sitting on the window sill is a young Daisy Macgregor, daughter of the shop owner?